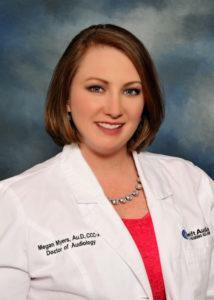 Dr. Megan Myers received her Doctorate of Audiology from Salus University in 2012. She previously received her BS in Communication Disorders from California University of Pennsylvania. Megan has spent years in several areas of the east coast working with pediatric through geriatric patients in environments ranging from small private practices to large teaching hospitals, including the Pennsylvania VA. She has utilized her audiology skills working at several Special Olympics events providing healthy hearing to each of the athletes.